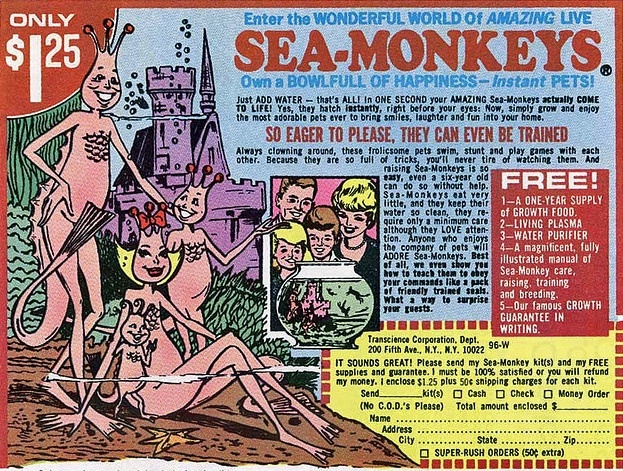 For only $1.00 (+.30 for shipping) I was going to be the proud owner of sea monkeys! I painstakingly filled out the order form, counted my money and expertly sealed it inside the carefully addressed envelope. As a last-minute safety measure, I placed a piece of scotch tape over the seal of the envelope to ensure that it’s journey from my house to the Unicorn House would be successful. Then I waited – filled with expectation and anticipation. My friend had also sent off for the kit around the same time and hers arrived before mine did. We were both eager to get started as we opened the instructions and followed each step carefully. Finally, she gently added the sea monkey eggs to the water and waited. The next day they hatched. She was so excited when she saw them floating around in her little aquarium. Me on the other hand, I was not just unimpressed, I was disappointed and felt ripped off. I had sent away for the cute family of creatures shown sitting on the beach in the ad, not these knarly looking wispy things. I was so unimpressed in fact that when mine came back I didn’t even open them. I don’t remember what happened to them, but I wasn’t going to waste my time now that I saw what they were. My friend and I had ordered from the same order form. We both had the same thought about what we were going to get, but the difference was I had set an expectation and when that expectation wasn’t met, I was unwilling to be happy with what I got. I felt ripped off and deceived. My friend on the other hand found joy and excitement in the little wisps that she received. She found wonder in the package that had arrived one day bringing with it a kit that allowed her to bring these creatures to life. When life and situations don’t go our way, when challenges delay our plans, when the promotion falls through, or the college we have been hoping for sends a rejection letter, when life doesn’t go the way we want it to, sometimes it can be hard to accept. When what we expect is not the reality, learning ways to change our perspective and see the wonder in the wispy weird things is a giant leap toward contentment and joy.